Yesterday my grandson asked me why we celebrate Labor Day, and as I thought of a simplified response to his passing query I thought…can you put a face to Labor Day? Christmas has the face of Santa. Thanksgiving the face of a turkey. Halloween’s face is the Great Pumpkin. Memorial Day is the face of all our soldiers who defended America against aggression and paid the ultimate price. Presidents Day ? Lincoln and Washington. The face of Labor Day? Not so easy is it? In fact, the man truly responsible for Labor Day’s inception was Eugene Debs, who organized a strike against the Pullman Company in 1894. Under his leadership, in just four days, over 125,000 workers on twenty-nine railroads across our country walked off the their jobs, hoping to bring the George Pullman to the arbitration table. The reason for the strike? The Pullman Company had their very own ‘enclave’ for their workers named Pullman, located on the south side of Chicago. When the company cut jobs and lowered wages they did not lower the rents or the price of other goods their workers were forced to pay. Aided by a media sympathetic to the railway owners, the AFL which did not support the striking union, and a populace that was divided the strike was ended but not before over $80M in damages was incurred, 30 people were killed and 57 injured. Debs himself was forced to spend six months in jail for failing to comply with a court order. President Cleveland on the other hand faced a public outcry over his use of federal troops to support an industrialist such as Pullman. In an effort to conciliate organized labor he pushed through in only six days legislation creating Labor Day and declared it a federal holiday. Pushing form over substance it seems is nothing new for D.C. Although to be fair, a commission did find the paternalism of George Pullman at fault for the strike and forced him to close down Pullman Town, which was then assimilated into Chicago. Ironically, Eugene Debs spent his months in prison reading the works of Karl Marx and upon his release formed the Socialist Party in America. 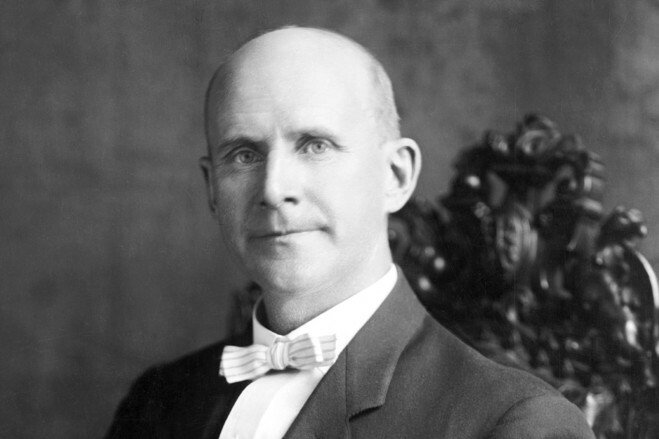 So I guess you could say the face of Labor Day might be Eugene Debs, a simple worker from Chicago who stood up to an industrialist on behalf of his struggling coworkers and lost. Or more simply – every working man and woman in America who desires a living wage for a solid day’s work.